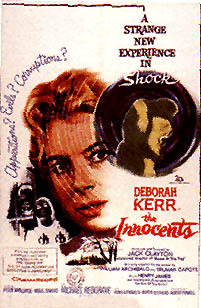 By far the finest adaptation of novelist Henry James' The Turn of the Screw, director Jack Clayton's exemplary ghost entry The Innocents boasts superb acting from all involved, a literate script from writers William Archibald and Truman Capote - and classy production values. Miss Giddens (Deborah Kerr) is being interviewed for the position of governess by the uncle of two orphans (Flora and Miles). The woman is something of a spinster, middle-aged and attractive, yet repressed. She is told that the kids live in the uncle's huge estate in the country...and that he doesn't want to be bothered by them. When Miss Giddens inquires about the previous governess, Miss Jessel, the uncle tells her that she died. Giddens is given the job and is told that she will now have supreme authority over the children. As she is taken to the estate in a horse-drawn carriage, Miss Giddens takes in the breathtaking countryside. She gets off to walk the rest of the way and hears an eerie voice calling out Flora's name. She sees Flora (Pamela Franklin) by the lake and introduces herself. The little girl leads her to the mansion, where she meets the housekeeper Mrs. Grose (Megs Jenkins). When Flora is out of the room, Mrs. Grose tells Mrs. Giddens that the girl is always disappearing. The housekeeper also says it was not she who was calling out Flora's name. At night (while taking a bath) Flora joyously reveals that her brother Miles is coming. But Miles is away at school and not due at the house. Miss Giddens hears strange sounds. Flora wakes up from her sleep and walks over to the window. Looking out into the garden, she begins to hum a haunting lullaby. The next day, Miss Giddens receives a communication from London. It's an unopened letter that the uncle has forwarded from Miles' school. It says that the boy has been expelled for "corrupting" the other students and is being sent home. Miss Giddens and Flora meet Miles (Martin Stephens) at the train station and bring him back to the house. The governess finds the boy extremely charming. In the evening, she stops by Miles' room. She tries to uncover what happened at his school but the boy seems oblivious to his expulsion. The following day while gardening, Miss Giddens sees a dark figure on the roof of the house. She goes up to investigate but finds Miles instead. The boy is feeding some birds...and he denies having seen the stranger. Miss Giddens sits down to talk to the children...and the brother and sister imply that they have many secrets between them. They ask Miss Giddens if she will play hide-and-go-seek. She agrees and Flora and Miles go off and hide. As she is searching for them, Miss Giddens sees the figure of a woman walk across the hall. In one of the rooms, she finds a jewelry box. When she opens it, the lullaby that Flora was humming plays. Nearby, she notices a framed photo of Peter Quint...a former servant at the house. Just then, Miles leaps out from behind the governess and puts his arms around her. He jokingly begins choking her but Miss Giddens becomes frightened by the child's roughness. Flora comes into the room and it is now Miss Giddens' turn to disappear. She runs downstairs and hides behind a pair of curtains. Turning towards the windows, she suddenly sees the face of the man in the framed photo. Terrified, she goes outside to look but there is nobody there. There are more sightings of ghosly people, including a woman dressed in black across the lake. When Miss Giddens asks Mrs. Grose about Miss Jessel, the previous governess...Mrs. Grose tells her that the woman was having an affair with Peter Quint, who was the uncle's valet. She says that all sorts of sordid things went on between the two in the house and that the children might have seen things they shouldn't have. As Mrs. Grose states, "there's too much whispering in this house." The governess comes to believe that the house is haunted by the pair and that they are an evil influence on the children. But is it in her imagination? Miss Giddens decides to send Flora, Mrs. Grose and the rest of the staff away from the house. She wants to have Miles alone so he can admit to her that Quint and Mrs. Jessel are indeed in the home. She confronts the boy but Miles refuses to tell her what she wants. In an almost demonic state, he yells at Miss Giddens and calls her an "old hag." The Innocents makes the most of the story's ambiguous plot. What happens to Miss Giddens can be interpreted in many different ways. It's an extremely effective psychological ghost story and a chilling film. An excellent, complicated performance from Deborah Kerr helps make this one of the top thrillers of the 60's. Kerr brings to the role a high beauty and, with her acting, she sets the pace for the whole film. Her incredulous shock, surprise and bewilderment throughout the proceedings is incredibly intense and realistic. Both Pamela Franklin and Martin Stephens as the children are also very good. They're precocious and cold...very British and somewhat unsympathetic. Truly believable, they make all the pieces fit together.